The NY Fed, Federal Reserve, Bureau of Economic Analysis, and Morgan Stanley put out a series of fascinating household debt charts we should all be aware of. Excessive debt is what makes extremely rich people go broke. Leverage is what crushed the economy once the music stopped playing in 2008. But boy is debt nice when properly used to grow one’s net worth in a bull market. Everybody should have the goal of being debt-free by the time they are no longer able or willing to work, no matter how low the interest rate. Having enough passive income to cover all your expenses while owing nothing to anybody is financial freedom at its finest. Let’s take a look at the charts and see if we can uncover some wisdom. The first chart shows that household debt has surpassed its 2008 peak. Some might say this a warning sign, but given population growth, GDP growth, corporate earnings growth, inflation, and labor force participation increases over 10 years, one should expect household debt to be higher today. The second chart below shows how the composition of household debt has changed since 2000. The two most worrying increases come from Student Loans (10.1% of total, orange) and Autos (9% of total, green). The debt burden of a higher education is getting heavier, while the returns are getting smaller. Unless you are already rich, wasting hundreds of thousands of dollars on a private school education is not optimal. You’d be much better off investing the difference and sharing some of your savings with your child upon his graduation from a public school. The internet has democratized access to education. At least with Student Loans, you build human capital. But with the rise in Auto Loans, all you’re buying is a depreciating asset. The Auto Loans line tells us that the auto industry could be facing some headwinds as it looks like it’s peaking. With the proliferation of ridesharing and self-driving cars, the need to own your own automobile will decline. Please don’t spend much more than 1/10th your gross income on a car. 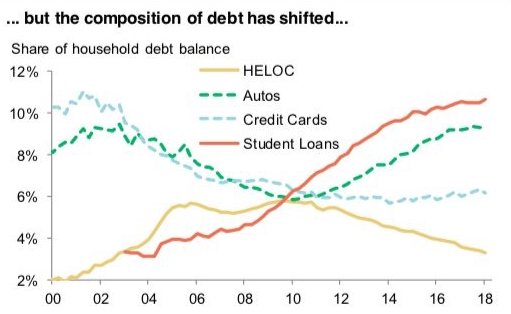 It is great to see Credit Cards share of household debt balance stay down. We all know that credit card debt is the most expensive debt in town. There’s a reason why credit card companies and credit card affiliate businesses are so profitable. They are counting on the irresponsible to carry a balance at an interest rate not even the great Warren Buffett can beat. Finally, it’s also good to see the HELOC debt balance seemingly follow a straight line down since 2012. Perhaps homeowners have finally learned their lesson not to use their homes like ATM machines. With interest rates ticking higher, the cost of a HELOC is becoming less attractive. The great news about the current US household debt composition is that mortgage debt has fallen from a high of 73.6% during the financial crisis to 68% of total debt in 2018. If we believe that a 5.6% swing is significant, then the below chart portends good news for homeowners and for banks. Bank executives will look at this chart and get more aggressive with their mortgage lending standards. Borrowers with lower credit scores should have an easier time getting loans. Less money down will be required to buy a home given banks will allow for higher debt-to-income or debt-to-equity ratios. With easier access to credit, more people will borrow more money than they could in the past to buy homes at already record prices. As a result, home prices have a strong tailwind. But of course, if lending standards get too loose, then an inevitable bust will occur. Pay attention to rising inventory, falling rents, and the return of no money down and negative amortization loans. This final chart may be the most important chart of them all. It shows that our Net Worth to Disposable Income is at its highest ratio since 1980, even higher than during the dotcom bubble and in 2007. 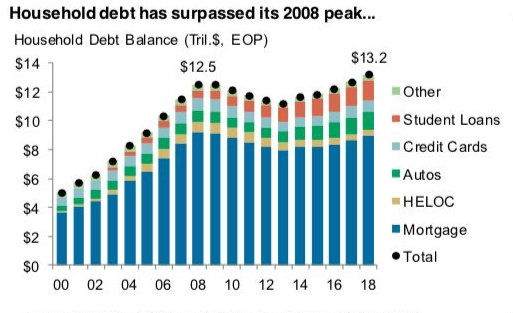 Meanwhile, our Debt to Disposable Income has fallen from a peak 1.38 in 2007 to 1.08 in 2018. What the Net Worth line doesn’t say is who owns most of the wealth in America and whether Disposable Income has kept up with inflation. Given we know that wages have underperformed asset appreciation since 2012, and the rich own an even greater percentage of America’s wealth today, having a record ratio of Net Worth To Disposable Income isn’t a good thing for everybody. In other words, the wealth gap is widening. We can also see how quickly the gold line declined between 2000-2003 and 2007-2009. Further, the rapid spike in the Net Worth ratio since 2016 probably also caught many by surprise. Americans who are past student loan debt and wise enough to not take on auto loans and credit card debt are richer than ever before. 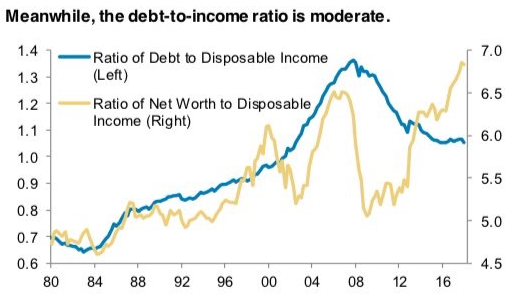 But the concern is that during the past two peaks (2000, 2007), the ratio of Net Worth to Disposable Income also peaked right before the economy turned south. I look at our collective boost in Net Worth since 2016 as sitting on a pile of the house’s money thanks to a surge in real estate and stocks. We can either use this “free money” to get even richer or we can cash in our chips and give ourselves high-fives for being wealthier than we ever thought possible. The best course of action is to probably do some of both. I’ve chosen to offload one rental property in 2017, paying down 40% of my outstanding debt in the process. I’ve redeployed some of the rental property proceeds in heartland real estate, optimized my cash with a CD Step Stool, and lowered my overall equity exposure by about 10%. By doing this, I expect to be better protected if we go through a slump. At the same time, I’m playing aggressive offense with about 20% of my net worth with individual growth stocks and alternative investments that will hopefully pay off if the good times continue. But the reality is, nothing will affect our household wealth more than our online business. Once you taste some financial freedom, you never want to go back to the salt mines again. Oh boy! Some of the genius responses on here have me really wondering about some of you. Especially the guy saying your debt could be as high as 600k with a 30k income as doable. Also 2x your first year salary is way too high as well. It should be more like 1x for salary at max. I’ll tell you about me in a sec. The solutions lie in LESS GOVERNMENT help. Those guaranteed loans and state lotto money which seemed like good ideas created this catastrophe in student debt amounts. The colleges had free reign to increase costs since the students would pay more to chase the carrot and get more loans. The guy above who says 600k debt is doable works for the college industry as a lobbyist (only explanation). As long as there is guaranteed money or “free” lotto money, colleges have zero incentive to curb costs. If the government only guaranteed a limited amount of loans, then less sheep, students could attend and the college would be forced to cut the extras and rising salaries. I experienced this in thet 90s when Zell Miller started Hope in Ga. It was good but created grade inflation so more students could get the funding, which is a separate issue. The tuition shot upwards. When students GPA dropped under 3.0 after a year, they were stuck paying for the next year year. Many dropped out. I had to pay my last year because I fell to a 2.99 gpa going into the last year and the tuition was 50% higher than when I started 5yrs earlier. My personal experience is I took out 150k in student debt with another 150k borrowed from my home equity with a grand total 300k. 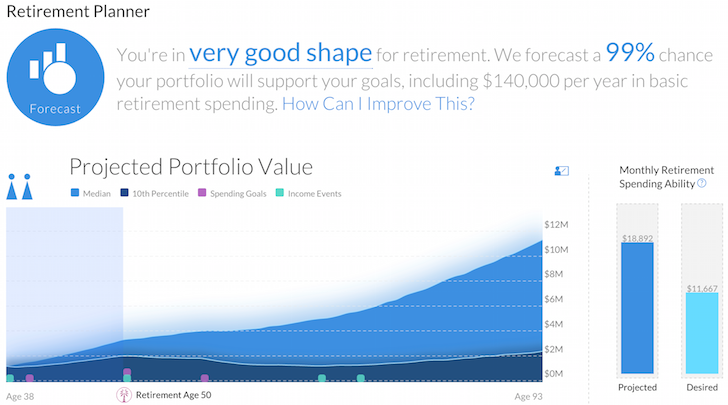 I made 140s income and great benefits that gave me 12% of my gross income into a 401k . My wife started working with her new upgraded degree too. The additional income of 30 to 40k from her penalized my student loan. I wasn’t able to write it off against my taxes! We’re talking $12,000 of interest. I wasn’t taking home enough money to pay hardly more than servicing they interest. I still had the same house and family of 6 to care for. No new cars, toys, or country club memberships. I more than doubled my income but had less dispensable income! That was 2011 when I started my new career. So 8 years later of paying on that loan it went as high as 180k and is now down to 152k. It’s not even the original balance yet! I have paid 115k into it!!!!!! Do you see the M%$F@&! Prawllbim? If you do the math on those “loan forgiveness” plans, you actually will pay the loan amount for most people in the 10 or 20 years while being owned by that organization and working for less money and presumably in a less desirable area. I sold my nice house that I built as general contractor on a very desirable lot and paid off the home equity 150k loan. I had enough to pay another 100k towards the student loan but opted to build another house. That wasn’t a wise move since it ended up costing a lot more. I’m refinancing today actually, to decrease the house payment from 3900 15yr to 3200 30yr at same rate and includes the credit card and other loan related to the building process. The good news is that I could sell it today and net 200k take home if I needed to pay off the loan right away. I’m going to make over 250k income this year which will allow me to make at least a $6000 payment towards that every month. I’m going for 2yrs or less to pay it off. (1) Graduates being forced to reallocate money from the usual trappings of youth (entertainment, travel, clothing, dining out, etc.) toward repaying hefty debt burdens. There isn’t additional human capital being injected into the workforce for this debt incremental to that of previous generations when they were young. Because of this, the returns to education are not increasing at a sufficient rate to justify the added debt. (2) Servicing this debt pushes out the average age when one would be able to afford a home and presumably start a family. This family formation process is responsible for a considerable amount of economic activity and by delaying it, there will be ripple effects. (3) One such effect is the inevitable decline in fertility rates. If families take longer to form then this decreases the window for having children. As population growth slows, fewer people will enter the workforce in the future and in our pay-as-you-go entitlement system, this should be very concerning. Slowing population growth will place a greater burden on the succeeding generations. I’m not great at prediction, but I do suspect something will have to occur to rectify this trajectory. One positive development has been a recent IRS private letter ruling which allowed an employer’s retirement plan to provide student loan repayment benefits to employees. It won’t solve all of society’s ills, but it is at least a step in the right direction. Very sobering charts. Why do American colleges insist on offering a 40-class credential when a 10-class credential will do for most majors and most entry-level jobs? And why do Americans accept such an antiquated definition of a bachelor’s degree. We are a terribly flawed species. My husband and I go out on a “date” most weeks, and we usually pick an Italian restaurant that serves a late HH out on the patio. We always end up with the college student servers. We usually ask them how they are handling school, what they are studying, their plans. So far, it seems that most of them that don’t have scholarship/family helping them with school, are doing community college for 1-2 years to keep college debt lower. The average debt when they leave school seems to be high 20’s/low 30’s if they are managing school costs on their own. We live in the Northern VA/Washington, DC area. There should be serious counseling before taking on student loans and going into low pay fields. The salt mines are calling and I must go. The education debt bothers me, but it isn’t surprising. As a parent looking at colleges this year for my daughter it is outrageous what they are charging. The biggest change being how expensive state universities and colleges cost. A state university used to be a good deal, but as funding has dropped more of the expense are being passed to the student and parent. This debt will cause the economy problems in the future since young people will not be able to buy houses, have children, and get married. I don’t believe student loan will cause a crash just a long and painful drag on our economy for a generation. My daughter is a Sophomore in college now so we’ve been through what you are going through now. My advice….don’t let them major in anything “fluffy”….just too expensive. So many of my daughter’s friends are majoring in subjects that will get them no where after college. If that’s what they really want…then I’d insist on a very cheap college or 1/2 years of junior college to start. My opinion any way…. Being forced into debt so early in life to get an education is not desirable. One upside of the incredible high taxes we pay here in Denmark (maybe the only worthy reason besides free health care) is that our education system is almost free. I paid off my final student loan last year. :) It still feels great to not have that burden on me after graduating in 2008. I am glad I paid off my student loans years ago. I might not even go to college now with that kind of cost. I have no debt. I half want to purchase a house right now and half afraid. It has been going up so fast. I don’t want the repeat of 2008. What do you guys think? Is it wise to buy now (Southern California market)? Buy property. Pay the loan back ASAP, reflect on the lessons. You don’t think that the housing market is getting hyped up right now in some parts of the country? Lending standards are higher so no one is expecting a meltdown like in 2008. However, after 10 years of house prices going up, one might expect a slowdown below inflation level. I personally wanted to buy in DC but apartments are really pricey now. Generally speaking, I agree with Sam. If you mean buying property in SF or NY, I would probably avoid that. If you mean the heartland, that’s probably a safe bet for another 5 years. If you buy in So. Cal now, just know you are buying at all-time highs with prices that could trend down for a couple years. But if you buy a house you can afford (3-5X max your gross income after 20% down), and you plan on owning it for 10+ years, you’ll probably be fine. I think there are better returns in the heartland though. Related: What If You Buy Property At The Top Of The Market? Is this means that there are no financial crisis in the near term? Other than student loans, people are not over-leverage. I wonder what will trigger the next financial crisis. Watch the US10Y-US2Y spread chart. It’s one of the best indicators for market corrections. It would be fair to predict that if anything derails the economy, it would be a revolt by student debtors who are left with a ton of debt and little to show for their education. I really want to keep educating folks on the dangers of higher education. That’ll be one of my missions over the next 5 years. I’m pleasantly surprised by the Auto loans figures not skyrocketing. I think people have woken up to how stupid it is to take on massive Auto debt. The mortgage debt figures are encouraging. It shows that homebuyers today have larger equity cushions and most likely higher creditworthiness. Therefore, a downturn will not be as violent as in 2007-2010. – There are more institutional owners of single family homes now and they are unlikely to let things go in a fire sale–they will opt to rent rather than sell at a low price. This inventory is effectively permanently removed from the private market. – Given the lessons of the last sale, banks are less likely to foreclose; they will rather make a deal with the owners in default and/or turn the property into a rental. – In CA at least, new housing starts are woefully small compared to historical averages and current demand. There was definitely more overbuilding and speculation in the last downturn. – Lending requirements, compared to the run up in prices in the last cycle, are extremely strict. Just ask anybody trying to get a loan without solid W-2 wage income. However, he did warn against buying the “wrong” type of property at this point in the cycle so maybe he means SF and LA. On another note, Jamie Dimon thinks treasuries will hit 5%, this will certainly put a damper on CDs and dividend paying stocks. 5% is a possibility, but when? I doubt we’ll hit 5% in the next two years. The economy would grind to a halt. Household debt charts don’t surprise me. I think we are doing pretty well with our personal debt situation. I fully paid of my medical student loans. I pay off our credit card balances in full every month. I have an auto loan for my Tesla, but it’s at low interest (3%) and I can easily pay it off today if I chose to. My wife has law student loans close to $200,000 but we expect this to be forgiven through PSLF in 5 years. We also have a $700,000 mortgage on our home, but we have a 10 year plan to pay it off. That trend is student loans is disturbing. Secondary education is seemingly exponentially rising compared to everything else. It can’t be sustainable for long. If your education starts costing you more than you can get in income you will never make any financial headway. I am seeing in in medicine where students are graduating with 500-600k loans and even approaching 7 figures. The only saving grace is if they stick to loan forgiveness programs by following strict criteria. Otherwise lower paying specialties could never get that amount off their back. Sam, do you have a % in your head for student loan/annual salary (much like 10% of salary for car, etc) where it would no longer make sense to go into that profession? I agree…the trend in student loans just doesn’t seem sustainable to me. We are effectively turning away a huge segment of the population from pursuing these fields that desperately need diversity in every sense in order to serve our population as a whole. At what point does this bubble burst? This is silly post. If, as you state, there are “desperate needs” to be filled, then market would solve problem. Compensation would rise to more than cover education needed to be competent at filling the need. To be honest the exact opposite of what you are suggesting is happening. Medicare has been slashing doctors reimbursements pretty much annual. An appendix that a surgeon used to get paid over $1200/case is now about $300. An MRI study of the head has shown similar decrease in reimbursements. So as a physician the only alternative to maintaining the SAME income as prior years is to see more patients. As health care costs come into the crosshairs even more in the future I can only predict that there will be even more cuts to physicians in terms of RVUs, etc. There are only so many hours in the day you can see patients or read images. Plus there are more and more regulations/government mandates that take a physician away from clinical care and become a glorified secretary inputting charts etc into electronic health records. There will be no market force that will drive up the cost again to attract medical students to go into a field that has a high litigious rate, high sacrifice, high hours, high student loan burden, and decreasing reimbursements. This is exactly what I thought, which is why it’s interesting to see some doctors argue the other way in my post about top 0.1% income earners on how they are easily making $1 million+. I set the “opportunity cost” of the loan at 10% (to account for the interest and the fact you could otherwise invest the money), and the term at 10 years. 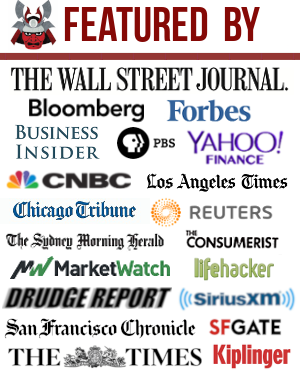 In the middle: $45/$1 => $30K of debt per $1K of annual salary. At the top (long career, good savings, good tax rates) => $60/$1 =>$40K of debt per $1K of annual salary. On average (this is average and backwards looking), a bachelors bumps your salary $30K/year. So even at the low $30/$1 you’re looking at a “break even” of $600,000! in debt. Lots of questions: Will these discrepancies remain the same going forward? How much of this is correlation (will a person who could get a bachelors but opts not to earn more than the average non-college-grad?) How relatively desirable are different jobs? I assumed the borrower could service the loan, but that assumption breaks down in hundreds of thousands. The opportunity cost might also be low depending on our assumptions about ROI of purchasing a house. But broadly, if I did my math right you should be willing to pay a lot to make another $10K a year for upwards of 40 years. Yeah, a 3X rise in 14 years or so isn’t sustainable. But boy would it have been a great investment! Since the debt forgiveness program forces you to pay 10% of your salary for what, 10 years, 10% sounds like a good limit. I’ll have to think about that good topic. It is recommended that your student loans shouldn’t be more than 2X your first year salary. 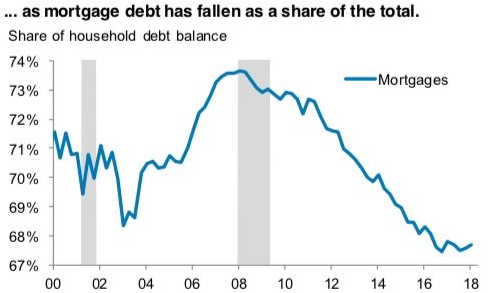 “Mortage debt has fallen as a share of the total”. Could it be that that many more households are renting? It could be. But it’ll be an apples-to-apples comparison. Therefore, the downtrend is a good thing since it is the greatest debt Americans have. I’m fortunate my student loans were paid off a long time ago. I went to a state school and graduated in 3.5 years to save money. Tuitions have risen so much since then it’s crazy though. I’m not surprised at all by this. It’s nice to see credit card debt way down. Student loans surprises no one, auto loans doesn’t surprise me. My husband and I only have mortgage debt for our primary now. I don’t think we have much leveraged. The important part of staying financially independent is minimizing exposure to other people’s liabilities. So be wary how you get get passive income. In a debt deflation (which we have not seen since the 30’s) even CDs won’t be safe. It’s interesting that mortgage debt is actually on down trend. In our area builders are throwing up houses like there’s a 2 for 1 sale or something. As your chart shows, student loan debt is probably going to be one of the biggest detriments to our economy in the next 20 years. IRS debt and student loan debt are the only two that immediately come to mind where the only way out of them is to pay them off or die. There are some forgiveness programs but most require a 10 year work commitment (usually at below market rates) in order to qualify. What are lawmakers supposed to do? Allegedly, people need to have some basic thinking abilities to get through college. Yet there seems to be lot’s of bozo’s who could not figure out that borrowing 120K to get a job that pays 50k was not too smart. What is government’s role in getting smarter people? Our debt situation is stable. We owe about $200k on our home and about $250k on our rentals. At this point, I’m about ready to cash out my chips on the rentals. I’d feel much better with less debt and the rentals aren’t making that much income anyway. Hopefully, the housing market will stay pretty stable for the next 2 years. Net worth to disposable income? Isn’t disposable income just the take-home pay? It’s probably around 20 this year. I agree with you last statement. When you feel wealthy you should feel worried because its the things that hit you out of the blue that will be the most painful. I wish you could do an article on how you evaluate a property on Realtyshares? I looked at it and thats a lot of data to consume. If you could break it down for us simpletons, it would be greatly appreciated. I actually put together a Real Estate Crowdfunding Resource Center that has a collection of all my research on the space. Check it out. My unstated goal for most of the last few years has been to pay off our debt in proportion to our safety asset allocation and potentially get it to 0 before the next major pullback. Q1 of next year it will reach 0 debt. While I haven’t changed my asset allocation as I don’t believe in market timing, I will admit I sleep a little better knowing in a few short months all debt will be gone. I have no qualms with auto loans being viewed a net worth destroying. For sure, cars do fall in value and incur maintenance along the way. A flip side argument may suggest that newer cars require less maintenance, are safer and use less money too. That’s worth something. If the auto loans increase societies safety, reduce emissions and auto maintenance then an increase in those loans may reflect a pent up demand since about 2010.